We offer many options for Birthday Parties depending on the children’s ages. You can choose the one that best meets your needs and budget. We will customize the party to suit you. There's no limit on the number of children that can attend. It’s a real riding experience through the woods. We have picnic tables on the premises so you can serve your birthday cake and open presents. You can use our heated clubhouse during the winter months. We also have a jungle gym for the children to play on while they take turns riding. The birthday child will be given a free DBF t-shirt in honor of their birthday. Children really enjoy feeding the horses, so if you'd like to bring apples, carrots, or pears, the kids can feed the horses while they're here. Some parents even give out "treat bags" rather than party favors as it's cheaper and helps to entertain the kids. You'll have the horses for an hour of riding, but it takes time to get the children's helmets on and to get them up on the horses, so the riding portion of the party will take up to 1.5 hours. 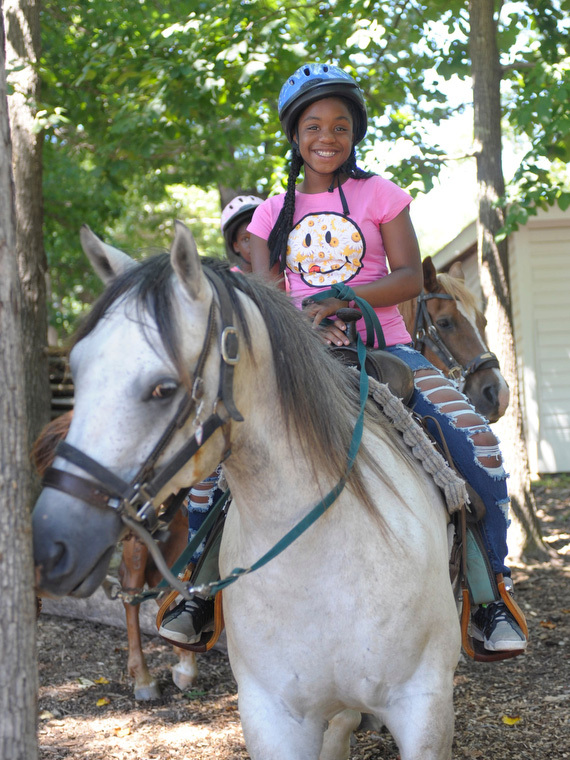 The children are hand-led on a 20 minute trail ride through the woods, so they have a real riding experience. They're not just led around in a circle inside a riding ring or around the barn. Since each horse can do the 20 minute ride 3 times in an hour, you'll need to divide the number of children by 3 to arrive at the number of horses you'll need. You're welcome to use the shaded picnic area when the weather's warm, or the heated clubhouse for an additional $25 when the weather turns colder. You can have as long as you'd like to open presents, serve cake, and play on the jungle gym. Riding helmets are provided for every child at no additional cost. If they have their own equestrian helmet, they are welcome to bring them, but no bicycle helmets may be used. The birthday child gets a free DBF t-shirt, so be sure not to leave without it! We encourage parents to participate in children's birthday parties. 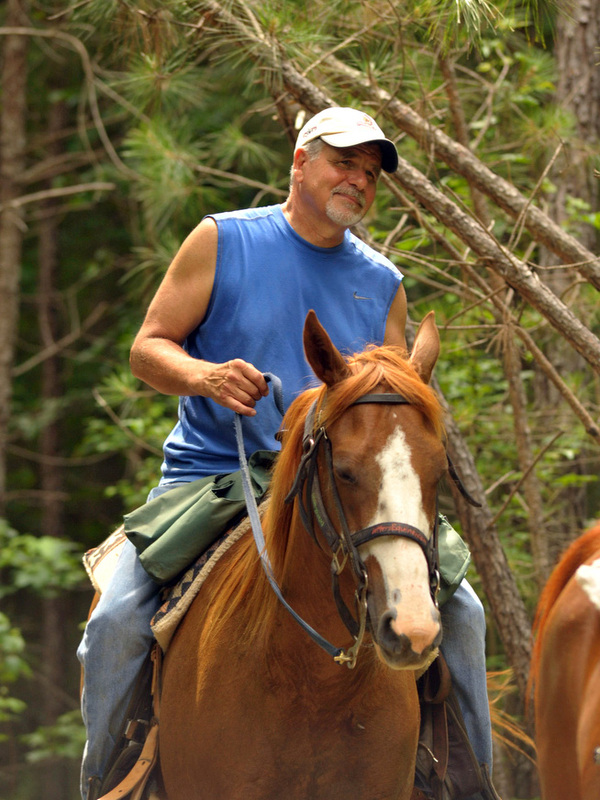 We will provide at least one of our staff to lead the horseback riding party on the trails, and we ask that parents volunteer to help lead the other horses. It allows parents to see their child ride and to take pictures of the event. 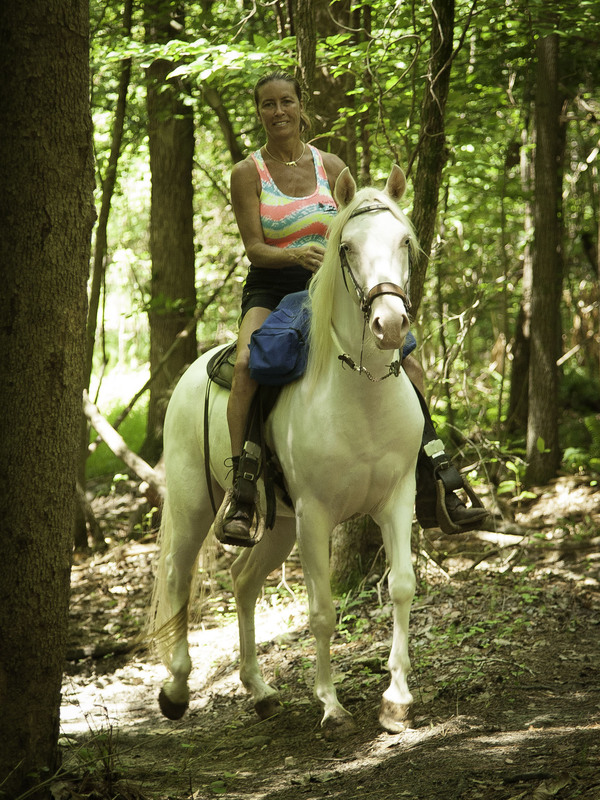 Our horses are very well mannered and easy to lead, but you'll want to be sure to advise parents that they will be asked to participate and to dress appropriately for walking along wooded trails. Although children may participate in hand-led rides when they are three years old and up, their balance isn't usually reliable enough until they are four to ensure that they won't topple off the horse, so we ask that parents of three year-olds walk alongside their child while being hand-led by one of our staff or another parent. This means that you'll need two parents for each 3 year-old child: one to act as a spotter for the child and one to lead the horse. We ask that parents supervise their children when they aren't riding the horses. We don't have anyone staffed to stay up in the playground area to watch them, and while we allow them the freedom to come down to the hitching rails to feed the horses apples and carrots that you may bring with you, we ask that parents supervise them to ensure that they interact with our horses safely. In other words, we don't want children underneath the horses' feet where they can get stepped on, walking or standing directly behind the horses, or feeding their fingers to the horses, because our horses can't tell the difference between a finger and a carrot until it's too late! Our involvement in children's birthday parties is limited to the horseback riding experience itself. We provide the horses, a guide, and the facility, and you basically throw your own party. If we have farm volunteers available on the day of your child's party, we're happy to lend them to you to help lead the horses, but since they are volunteers, we never know how many we'll have on any given day. The best course of action is to notify parents that they will be an active participant at the party and to dress appropriately for visiting a farm, i.e. avoid wearing dresses, sandals, flip flops, your best shoes, etc. The basic birthday party package costs $200 and includes 2 horses and use of the playground and picnic area. Since there are three 20-min. rides in the hour, 2 horses will accommodate 6 children. You can add additional horses for just $50/horse. We no longer accpet credit cards as a form of payment. You may use a credit card (Mastercard, Visa, or Discover) to secure your reservation with a deposit, but no credit cards or checks will be accepted when paying your balance at our farm. The schedule for the hand-led birthday party rides refers to the starting time of the ride. You can choose to either ride first or have cake and presents first unless you are having your party at 3pm during the winter months (Nov - Feb). In that case, you need to plan to ride first and have cake and presents after the ride to avoid the possibility of having two birthday parties wanting to use the heated clubhouse at the same time. The clubhouse is only large enough to accommodate one party at the time. Children riding on their own follow the regular trail riding schedule. If it rains, you can simply reschedule your party. You can even pre-select a rain date to include in your invitations for any day except the day immediately following the originally scheduled date. 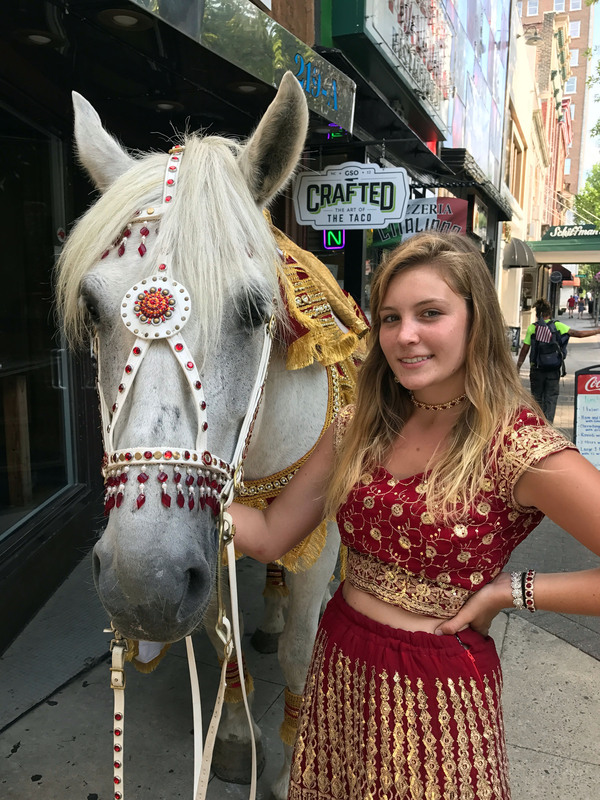 If you will bringing children to the party whose parents won't be attending, you will need to have the children's parents sign the horseback riding liability release form and bring them with you in order for their children to ride. Reservations and a $40 deposit are required. Reserve your child's party today!